by Ralph Benko, Contributing Author: President Barack Obama’s critics who liken him to the feckless Jimmy Carter have it all wrong. The Obama White House is engaged in a campaign to override and overrun Congress with executive power the likes of which haven’t been seen since President Richard Nixon. The Obama administration is using the Labor Department to ram through something like Card Check (repeatedly failed to pass the Senate), the Environmental Protection Agency to impose something like Kyoto Treaty protocols (voted down by the Senate 95-0), the NLRB shutting down Boeing’s $2 billion Dreamliner factory in South Carolina and other initiatives, many of dubious constitutionality. It’s a lengthening list. My fellow columnist Charles Kadlec reviews a choice few “executive actions” this week here at Forbes.com. Don’t miss it! Alarm bells really began sounding when the New York Times reported that the IRS is looking into reversing a 30-year-old policy to apply a gift tax to donors to social welfare organizations. There is almost no chance that this tax came from career staff alone. Sen. Orin Hatch and five other members of the Senate Finance Committee sent a letter to the IRS commissioner demanding an explanation. The IRS has a long and noble tradition of resisting White House efforts to politicize it. But politicians have, from time to time, misused the IRS. Are Nixon-like abuses recurring? The evidence is only circumstantial. But what is known is troubling. It demands a close look … if only to dispel the suspicion that is settling upon the Internal Revenue Service. The IRS’ credibility lies in its hard earned reputation for integrity. It deserves to have its reputation cleared or, if its integrity has been violated, have Commissioner Alexander’s axiom that “political or social views are irrelevant to taxation” promptly restored. President Obama and his White House staff have made it clear that they view these organizations with deep hostility. The President himself, in a heated political context, referred to certain 501(c)(4) organizations as “a threat to our democracy.” His White House Communications Director, Dan Pfeiffer, charged that the “powerful interests” supporting some of these organizations “are literally buying elections” . . . . The Senators are right. This tax appears as almost certainly constitutionally defective under the U.S. Supreme Court’s Citizens United decision. The timing of the effort to tax political speech itself seems odd, even suspicious. Come what may this “power to destroy” will be effective during the Obama campaign’s billion dollar re-election effort, chilling individuals from funding opposition groups. Coincidence? Who will get to the bottom of this? First, of course, is the mainstream media. Katherine Graham showed courage by allowing Ben Bradlee to dispatch Woodward and Bernstein to go after the abuses of the Nixon White House. We can but hope that her successor, son Donald, will rise to his late mother’s stature. Perhaps the Post, or its investigative peers, The New York Times (who scooped the Post in its own back yard on this one) and the Wall Street Journal, already are on this. Also, this matter falls under the jurisdiction of the House Committee on Government Operations, chaired by Rep. Darrell Issa, and of the House Ways and Means Committee, chaired by Rep. Dave Camp (and its Oversight Subcommittee chaired by Rep. Boustany). These have the power and duty to look into what’s going on. At the top of the chain are the relevant political appointees. Sen. Hatch and colleagues do well to address the Commissioner, Douglas Schulman. He was appointed by President Bush and is presumptively innocent of politicization. But the Commissioner is an administrator not a policy maker. The relevant officials are in the Treasury Department itself. Secretary Geithner’s reputation is, at least vicariously, involved. He might wish to initiate an internal review … before Congress does. Logically, acting Assistant Secretary for Tax Policy, Michael Mundaca, would know the facts. Mundaca appears to be a recess appointment … without Senate confirmation. A breach in the process? Deputy Secretary Neal Wolin also might know something. Wolin, briefly, served as deputy counsel for economic policy in the Obama White House and thus has direct White House ties. Did he discuss this with the White House? Having served as General Counsel at the Treasury Department from 1999 to 2001 he knows how to get things done. His CIA background, not inherently sinister, is, yes, unsettling. The upshot? President Obama is no Jimmy Carter. He is proving himself to be effective and even ruthless. Likening him to Nixon in no way implies crimes or any impeachable offense. It does suggest a certain Machiavellian ethos. Constitutionalists of all parties, Left and Right, find having what looks like a “soft despot” in the Oval Office alarming. Obama is on track to rival Richard Milhous Nixon for that dubious status. Tags: Ralph Benko, op-ed, politics, Barack Obama, Richard Nixon, Jimmy Carter To share or post to your site, click on "Post Link". Please mention / link to America's Best Choice. Thanks! Posted by Bill Smith : Post Link --> 5:50 PM 0 Comments - Share Yours! The Buzz: The elections supervisor in Rick Scott's home county refuses to recognize a new law the governor signed out of concerns that the U.S. Department of Justice hasn't decided whether it violates a law protecting minority voters. "Since assuming office in 2000, it has been my practice to meticulously comply with the requirements," she wrote May 21. "The purpose of this letter is to inform you that due to our 'covered' status, I will not implement any changes resulting from the Governor's signing of CS/CS/HB 1355 until we receive notification that the bill has been precleared by the U.S. Department of Justice." Tags: Florida, elections, election laws To share or post to your site, click on "Post Link". Please mention / link to America's Best Choice. Thanks! Posted by Bill Smith : Post Link --> 10:06 AM 0 Comments - Share Yours! The Miami Herald is reporting on Florida's new election law bill, HB 1355, signed by Governor Rick Scott to reduce election fraud. The elections billpassed the Florida Legislature with overwhelming Republican support. -- Early voting is reduced from 15 days to eight days, but the total number of early voting hours will stay at 96; no additional early voting sites. -- Voters who have moved or changed their name since the last election can only update their status at the polls if they have moved within the same county. All others must cast provisional ballots. -- Third-party groups that register new voters must submit forms within 48 hours or face fines of up to $1,000. -- A nine-member panel will choose the date of Florida’s 2012 presidential preference primary to maximize the state’s influence in selecting the Republican nominee. -- The 2012 primary election will be on Aug. 14, two weeks earlier than usual. -- Democrats, labor unions and voter advocacy groups have been up in arms for weeks, saying the bill was designed to stifle turnout in Florida next year, especially among students. Democrats in Congress have asked the U.S. Justice Department to block the bill from taking effect. Tags: Florida, election law, Gov. Rick Scott, reducing voter fraud, To share or post to your site, click on "Post Link". Please mention / link to America's Best Choice. Thanks! Posted by Bill Smith : Post Link --> 3:44 PM 0 Comments - Share Yours! Ralph Benko is a senior economics advisor to The American Principles Project and author of The Websters’ Dictionary: How to Use the Web to Transform the World. He is working on a new book, called "A Golden Age: the political consequences of the peace." This article which first appeared in the Forbes was submitted by contributing author Ralph Benko to the editor of the ARRA News Service for reprint in other blogs. Tags: Ralph Benko, Federal Government, federal deficit, fiscal responsibility, free markets, and constitutional integrity, Ronald Reagan, Tax reform, Regulatory reform, Energy policy, To share or post to your site, click on "Post Link". Please mention / link to America's Best Choice. Thanks! Posted by Bill Smith : Post Link --> 9:10 AM 1 Comments - Share Yours! Tags: AF Branco, political cartoon, Barack Obama, drilling, votes, oil, To share or post to your site, click on "Post Link". Please mention / link to America's Best Choice. Thanks! Posted by Bill Smith : Post Link --> 8:08 PM 0 Comments - Share Yours! Tags: AFL-CIO, Boeing, National Labor Relations Board, NLRB, Obama Administration, SEIU, Bill Wilson, ALG To share or post to your site, click on "Post Link". Please mention / link to America's Best Choice. Thanks! Posted by Bill Smith : Post Link --> 9:03 PM 0 Comments - Share Yours! The US is expected to reach its statutory debt limit of $14.3 trillion on or before May 16. To avoid default, Congress must pay $207 billion in debt interest. FY11 can be fully funded without raising the debt ceiling. Congress shouldn’t be rushed or bullied into raising the debt limit. No one is asking the US to default on its debt. All that is needed to avoid a default is to make payments on the interest. The Treasury is able to delay a default date by selling assets, shifting cash around, and borrowing money from the Fed that does not count to the debt ceiling. Congress has never failed to increase the debt limit. In the last 10 years, the debt ceiling has been raised 10 times. Since 1940, the debt limit has been raised 100 times. Geithner has changed the default date 4 times in 2011 alone, the latest projection being August 2. Institutional reform is needed to fix a broken system. The debt ceiling does not effectively restrain spending, yet is simply raised at Washington’s whim, at a historic average of 1.5 times per year. Cutting spending is not something to be delayed. In the end, we are at greater risk to default under Washington’s charge card and excessive spending. American families cannot just increase their credit limit when their credit card debts become too burdensom, and Congress should not either. Excessive government spending has economic consequences for all Americans: higher cost of living, higher interest rates, and higher taxes. Interest and mandatory spending, such as Social Security and Medicare, will consume 90 percent of the budget by 2020; leaving 10% for everything from defense to education and infrastructure. Our heavy debt load is a bipartisan issue; spending doubled under President George W. Bush and is expected to double again under President Obama. We have seen Washington come together to make significant cuts to spending. The debt ceiling must be handled with the same sobriety and focus. 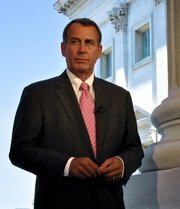 January 6, 2011 Debt ceiling: between March 31 and May 16, 2011. March 1, 2011 Debt ceiling: between April 15, 2011 and May 31, 2011. April 4, 2011 Debt ceiling: no later than May 16, 2011. May 2, 2011 Debt ceiling: still May 16; default August 8. Tags: facts, US Debt Limit, United States, Federal Government To share or post to your site, click on "Post Link". Please mention / link to America's Best Choice. Thanks! Posted by Bill Smith : Post Link --> 1:46 PM 0 Comments - Share Yours! Rasmussen Reports: President Obama on Tuesday encouraged Congress to move forward on immigration reform, saying his administration has “strengthened border security beyond what many believed was possible.” But most voters don’t share the president’s view. 64% disagree and say it is not secure. 29% who believe it’s Not At All Secure. Most voters say securing the border is a higher priority than addressing the status of illegal immigrants already in the United States. Most voters continue to feel that the policies of the federal government encourage illegal immigration. 53% of voters say the U.S. military should be used along the border with Mexico to prevent illegal immigration -- which is down 145 from a year ago. Tags: Rasmussen Reports, border security, sanctuary cities, federal funds, illegal aliens, amnesty, illegal aliens To share or post to your site, click on "Post Link". Please mention / link to America's Best Choice. Thanks! Posted by Bill Smith : Post Link --> 8:59 AM 0 Comments - Share Yours! Allen West A Man Must Stand for Something or He Will Fall For Anything! AllFiredUpRadio: Florida Republican Congressman-elect Allen West talked about the state of U.S. relations with Israel and Iran's nuclear program at a pro-Israel conference. Other speakers included the chief spokesman for the Israel Consulate of Florida and Puerto Rico as well as representatives from Jewish groups. Americans Against Hate was founded in 1998 to inform the public of the dangers of groups and people within U.S. involved in terrorism overseas. Posted by Bill Smith : Post Link --> 8:54 PM 0 Comments - Share Yours! For The Dems: High Gas Prices Are "Not An Issue"
With Gas Prices Nearing Record Highs, The Democrat Finance Chairman Says "I Don’t See That As An Issue At All. The Issue I See Is Who Shares." Tags: Democrats, stupid people, high gas prices, gas prices, To share or post to your site, click on "Post Link". Please mention / link to America's Best Choice. Thanks! Posted by Bill Smith : Post Link --> 3:55 PM 0 Comments - Share Yours! Rasmussen Reports: New legislation being considered by the House would stop all federal funding for cities that give sanctuary to illegal immigrants, and most voters like the idea. But very few believe Congress is likely to pass such a measure. A new Rasmussen Reports national telephone survey finds that 59% of Likely U.S. Voters favor a cutoff of federal funds to so-called sanctuary cities. Just 28% are opposed and 13% are not sure. Regardless of Congressional action, 58% of voters think the U.S. Justice Department should take legal action against cities that provide sanctuary for illegal immigrants. Twenty-six percent (26%) are opposed to having the Justice Department prosecute sanctuary cities and 16% are not sure. Sixty-five percent (65%) oppose the establishment of sanctuary cities. Nearly one-in-five voters (18%) are undecided about them. Only 17% favor sanctuary cities. Tags: Rasmussen Reports, sanctuary cities, federal funds, illegal aliens To share or post to your site, click on "Post Link". Please mention / link to America's Best Choice. Thanks! Posted by Bill Smith : Post Link --> 9:25 AM 0 Comments - Share Yours! Tags: opposition, presidential, executive order, free speech, 1st amendment, disclose act, federal contractors, government contracts, To share or post to your site, click on "Post Link". Please mention / link to America's Best Choice. Thanks! Bill Smith, Editor: The below cartoon by William Warren is timely and to the point. Of course, we have now learned that Obama's "gutzy move" in the killing of "Osama" was really Obama's traditional method of of "duck and cover" and then "taking credit" for actions by others that were successful. We have CIA Director Leon Penetta to thank for the "gutz" to not back down and to push the operation to remove "OBL." It was nice to learn that there are still some people in the Obama administration that care more about America than their careers. Even our sometimes incoherent Vice President Biden was more on top of this situation. And then of course the Navy Seal delivered the real "gutzy" message for America. If President Obama wants to be president for another term, he had best get rid of "lead anchors" like Senior White House advisor Valerie Bowman Jarrett. It is one thing to run and to be elected president; it is quite another thing to be "the president." Mr. President, git rid of the "noise" on your White House staff. Don't worry about Jarrett causing problems after she leaves. Just give her the pink slip with a reminder that that AG Eric Holder is setting on the investigation of her Chicago misdeeds. by William Warren: After Obama made the "gutsy move" to take out Osama Bin Laden, he should consider making even more gutsy moves. 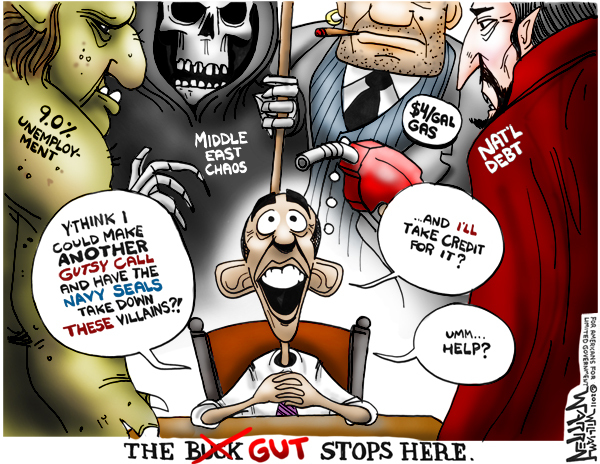 Tags: Obama, Political Cartoons, William Warren, gutzy, To share or post to your site, click on "Post Link". Please mention / link to America's Best Choice. Thanks! "Chairman Tisch, thank you for that introduction. And thank you for the chance to be here. “Let me start by expressing my admiration for what you do. You come from many different backgrounds. But you're united by a common interest in the prosperity and security of our nation. “Last night marked one week since the operation against Osama bin Laden, the man who orchestrated the horrific attack upon this city nearly 10 years ago. “Bringing justice to Bin Laden was an important moment for America and all of the free world. But the challenges that lie ahead here at home remain formidable. “I'm grateful for the opportunity to share my thoughts tonight on how we need to address those challenges together, as a nation. “I came to be Speaker of the House by way of small business. “Before I ran for Congress, I was president of a small business in West Chester, Ohio -- Nucite Sales. We were manufacturers representatives in the packaging and plastics industry. “But Nucite wasn't my first life experience with small business. That came earlier, when my brothers and I grew up mopping the floors of Andy's Cafe, a tavern outside of Cincinnati established in the 1930s by my grandpa, Andrew, and run for decades by my dad, Earl. “It would be fair to say I'm not from around here. I come from a working class family of what you'd call Kennedy Democrats. I have 11 brothers and sisters. “These experiences taught me a lot, long before I entered government service. “They taught me our economy is a product of our people. Our economy does best when government respects our people enough to give them the freedom to do what they do best. “I believe our mission as legislators is to liberate our economy from the things that impede growth. . .to provide clear policies, so that innovators and entrepreneurs have the green light to move forward and create jobs, without having to worry about second-guessing from Washington. “My message to you tonight is that we will not succeed in balancing the federal budget and overcoming the challenges of our debt until we commit ourselves to government policies that will let our economy achieve long-term growth. Our economy won't grow as long as we continue to trip it up with short-term gimmicks from Washington. “Many of our problems can be traced to a misguided belief by politicians that the American economy is something that can be controlled or micromanaged or influenced positively by government intervention and borrowing. “All too often, rather than providing long-term policies that will help our economy expand, government offers short-term fixes that do little right away, and end up making things worse over time. “When things aren't going well in our economy, the impulse in Washington is usually to respond with something big...something quote-unquote ‘comprehensive.’ The assumption is that this will provide reassurance to job creators. But it usually has the opposite effect in practice. “We saw this with Dodd-Frank. There was a financial meltdown in our country, and millions of Americans were hit hard. But Washington's response was all wrong. “We got a consolidated banking system with a small number of large firms operating as public utilities. “We got a lot of new rules that make job creation and investment more difficult. “And the government mortgage companies that triggered the whole meltdown went untouched. “For job creators, the ‘promise’ of a large new initiative coming out of Washington is more like a threat. It freezes them. Instead of investing in new employees or new equipment, they make the logical decision to stand pat. “The American economy is the sum total of the hard work and ingenuity of our people. “When the economy grows, it's not because of a new government program or spending initiative. It's because a lot of people in the private sector worked hard, and were successful in overcoming the obstacles thrown in their path. “The rash of ‘stimulus’ legislation passed by Congress in recent years has been one of those obstacles. “The recent stimulus spending binge hurt our economy and hampered private sector job creation in America. “The effect of adding nearly a trillion dollars to our national debt -- money borrowed mostly from foreign investors -- caused a further erosion of economic confidence in America, and increased uncertainty for millions of private-sector job creators. “The massive borrowing and spending by the Treasury Department crowded out private investment by American businesses of all sizes. “Americans were told the stimulus would create millions of new jobs, and that most of them would be private sector jobs. It didn't happen. “Job creators were looking for certainty. You don't get long-term certainty from short-term government programs. “The lesson of the stimulus era is that short-term government intervention is no substitute for long-term economic investment, private initiative, and freedom. “I believe it's time to leave that era behind. “We've also seen the arrogance of government recently in the skyrocketing gas prices our citizens and businesses are dealing with. “There's a clear connection between high gas prices and the weak dollar that some in Washington have quietly welcomed over the past couple of years. “It's well known that when you print tons of money, the dollar sinks, and the price of food and energy rises -- significantly. Yet the American people are told there is nothing that can be done about it. This is simply untrue. “Washington has also kept most of our nation's vast energy resources under lock and key for decades, over the clear objections of the American people -- the people who own those resources. “If we had listened to the people decades ago -- or even a few years ago -- many of these resources would be available to us right now to lower the price of energy. And we would probably have about a million private-sector jobs in America that we don't currently have. “Instead what Washington has done is raise the specter of higher taxes, creating more uncertainty for those in America who create jobs. “Washington's arrogance has triggered a political rebellion in our country. “I don't think ‘rebellion’ is too strong of a word. The revolt we have seen by ordinary citizens over the past few years is like nothing we've seen in our lifetime. And it's happening in part because the arrogant habits of Washington are having real economic consequences. “The debt limit debate presents our nation's leaders with the opportunity to reverse these habits and prove that we're starting to get the message. It's a chance to change course and admit that reactionary, short-term Washington solutions aren't always best. “Creating a sustainable fiscal structure for the federal government is essential for long-term economic growth. Particularly when it comes to entitlements. “We have a chance to provide certainty to job creators by signaling that our government is finally set to take a new approach when it comes to the spending and borrowing that has put us so deeply in debt. “As you know, the president has asked Congress to increase the debt limit, and to do so without preconditions. “There are those who insist we shouldn't ‘play games’ with it. “With all due respect, this is the arrogance of power -- and the American people won’t stand for it. “This is the time to end the spending binge and prioritize and modernize what we spend. “There's a reason the debt limit can't be increased without a vote of Congress. The debt limit is set in statute specifically so that the executive and legislative branches of our government have to deal with the difficult fiscal choices we face. “I know there are many in this room who are uneasy with this debate. I understand your concerns. “It's true that allowing America to default would be irresponsible. But it would be more irresponsible to raise the debt ceiling without simultaneously taking dramatic steps to reduce spending and reform the budget process. “To increase the debt limit without simultaneously addressing the drivers of our debt -- in defiance of the will of our people -- would be monumentally arrogant and massively irresponsible. “It would send a signal to investors and entrepreneurs everywhere that America still is not serious about dealing with our spending addiction. “It would erode confidence in our economy and reduce certainty for small businesses. And this would destroy even more American jobs. “So let me be as clear as I can be. Without significant spending cuts and reforms to reduce our debt, there will be no debt limit increase. And the cuts should be greater than the accompanying increase in debt authority the president is given. “We should be talking about cuts of trillions, not just billions. “They should be actual cuts and program reforms, not broad deficit or debt targets that punt the tough questions to the future. “And with the exception of tax hikes -- which will destroy jobs -- everything is on the table. That includes honest conversations about how best to preserve Medicare, because we all know, with millions of Baby Boomers beginning to retire, the status quo is unsustainable. “If we don’t act boldly now, the markets will act for us very soon. That's the warning we got from Standard & Poor's a few weeks ago. “If we fail to use this as a moment to demonstrate that we're getting serious about fixing the debt, the result will be fewer jobs, less confidence, and more uncertainty. “The debt limit debate is critical because it's forcing us to make a choice right now as a nation. It's a choice between the policies of the past, and a new vision that acknowledges we can't tax, borrow and spend our way back to prosperity. “The big myth of the current budget debate is the notion that in order to balance the budget, we have to raise taxes. “The truth is we will never balance the budget and rid our children of debt unless we cut spending and have real economic growth. 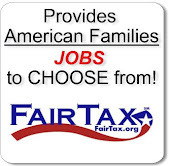 And we will never have real economic growth if we raise taxes on those in America who create jobs. “I ran for Congress in 1990, the year our nation's leaders struck a so-called bargain that raised taxes as part of a bipartisan plan to balance the budget. “The result of that so-called bargain was the recession of the early 1990s. It wasn't until the economy picked back up toward the end of that decade that we achieved a balanced budget. “Today some seem intent on recycling the 1990 budget deal, only this time with much larger tax increases. “That's not going to happen, and I've told that to the president. A tax hike would wreak havoc not only on our economy's ability to create private-sector jobs, but also on our ability to tackle the national debt. “Balancing the budget requires spending cuts and economic growth. We won't have economic growth if we raise taxes and fail to address the drivers of our debt. “The mere threat of tax hikes causes uncertainty for job creators -- uncertainty that results in less risk-taking and fewer jobs. “If we're serious about balancing the budget and getting our economy back to creating jobs, tax hikes should be off the table. “Rather than increase government spending, President Kennedy told the New York Economic Club, we should cut taxes significantly, and take steps to ‘increase incentives and the availability of investment capital’ for employers. “I would note that my colleagues and I are not calling for tax cuts in our budget. Rather, we're calling for an end to the threat of tax hikes -- and a fundamental reform of the tax code -- to provide certainty to those in our country who create jobs. We're calling for an end to the government spending binge that is crowding out private investment and threatening the availability of capital needed for job creation. “Addressing our debt requires action. ‘Pain’ comes only from inaction. “Suffering comes from standing pat and waiting for investors, job creators, and capital markets to impose a solution before elected leaders cannot. “Root-canal economics has a name, and its name is Doing Nothing. The greatest threat to our economy and our future is doing nothing. “We urgently need to enact reforms that will protect and preserve critical programs like Medicare and Medicaid. “If we do nothing, as some propose, that guarantees benefit cuts for seniors. “Let me repeat that, because it’s a crucial point that is too often overlooked. “If we do nothing, seniors’ benefits will be cut. “And to those who contend that the economy is too weak to take on the challenge of entitlement reform -- I would simply say, you've got it backwards. “The truth is that making fundamental reforms to these programs would be good for the economy -- and good for the next generation. “It's possible to make changes in a way that will ensure future beneficiaries will have access to the same kinds of options as Members of Congress currently have. “The budget put forth by our Budget Committee Chairman, Paul Ryan of Wisconsin, accomplishes this. “And instead of raising taxes, it calls for fundamental reform of the tax code -- a priority for us that will be led by Dave Camp of Michigan, the chairman of the House Committee on Ways & Means. “There are also other steps that can be taken immediately to help free our economy and support private-sector job creation. Many of them are outlined in the Pledge to America, the governing agenda we put forth last year by listening to the people. “We can stop the Environmental Protection Agency from proceeding with a backdoor energy tax that will further increase gas prices and destroy jobs. “We can pass the REINS Act, authored by my colleague Geoff Davis of Kentucky. It requires congressional approval of any new government rule with an estimated economic cost of $100 million or more. “We can use trade agreements with Panama, Colombia, and South Korea to create jobs and boost our economy by opening new markets to American exports. “Coupled with the fundamental spending reforms and tax reforms I've described, these policies will clear a path for long-term, sustained economic growth. “With such policies in place, the federal budget can be balanced. “In closing, let me say I'm humbled by the opportunity to serve our country. “We owe it to the people of our country to ensure that the opportunities our generation had are there for current and future generations. “We owe them a humbler government that lives within its means and values the entrepreneurial drive of our people, with policies that unleash the awesome potential of our economy. “For those of us in Washington, this has to be our focus. “Until our economy is back on track and the American Dream has been restored, there can be no rest. “It starts with freedom. In America, it always has. Tags: US House, Speaker, John Boehner,New York, Economic Club, the economy, Jobs, Debt, Gas Prices, job growth, cut government spending, tax hikes, federal regulations, opening new markets, American goods To share or post to your site, click on "Post Link". Please mention / link to America's Best Choice. Thanks! Posted by Bill Smith : Post Link --> 9:38 PM 0 Comments - Share Yours! ARRA News Service - The following article and video identifies action taken by some Texas law makers to stop the insanity of TSA body groping and naked scanning of Americans. Nine States have had representatives willing to take stands against the abuses of TSA. Where are the other states? In reference to the below video, both of Simpson body groping, body scanning bills out of committee. Andy Hogue of The Lone State Report reported on Friday (5/5/2011): Last month, Rep. David Simpson's (R-Longview) headline-making bill, HB 1937, to prohibit "body-groping" searches by airline security workers, was approved by the House Criminal Jurisprudence committee. An accompanying bill, HB 1938, to prohibit the use of full body scanners that use backscatter X-rays to create a visual image of a person’s naked body, was voted out of the same committee this afternoon. Both bills now await placement on the House calendar -- less than a month before the Legislature is set to adjourn. In a press release this morning, Simpson said HB 1937 is faring well. It has 87 members in support and the backing of at least three members of the Texas Congressional delegation. “Our citizens are forced to undergo unconscionable procedures at the hands of the TSA," said Congressman John Carter. "The fact that someone is traveling is not justification to submit them to humiliating and unconstitutional invasions of their privacy. I am glad to support the efforts of Rep. David Simpson and his co-authors in the Texas Legislature to stop the TSA's abuses." Congressman Louie Gohmert addressed personal privacy and security concerns. "Security is essential when traveling; however, airport full body scans invade very personal privacy bounds without a warrant, without probable cause, are offensive, and yet would not even detect some dangerous things," he said. "It is important that we balance individual privacy and security. ..."
Nine state legislatures -- including Alaska, New Jersey, New Hampshire, and Pennsylvania -- have legislation pending to restrict the Transportation Safety Administration's search procedures at airports, Simpson noted. . . .
Tenth Amendment Center: Texas State Representative David Simpson speaks at Nullify Now! Austin on April 16th, 2011. The Nullify Now! event was sponsored by The Foundation for a Free Society and the Tenth Amendment Center. Simpson is the lead sponsor of two bills in the Texas legislature to nullify the TSA -- HB1937 would ban groping in violation of the 4th Amendment (all of it), and HB1938 which would ban TSA scanners from all Texas airports. HB1937 has already been passed out of committee, unanimously. "We have a runaway government because we have gone to sleep and settled for it..."
"Of all tyrannies, a tyranny sincerely exercised for the good of its victims may be the most oppressive"
Tags: nullification, TSA, ban, body groping, HB 1937, body scanners, HB 1938, nullify-now, Tenth Amendment, 10th Amendment, David Simpson, Constitution, liberty, liberty, Texas, airports, Ron Paul To share or post to your site, click on "Post Link". Please mention / link to America's Best Choice. Thanks! BankRupting America: For years, the government has spent far more than it can afford. This history of overspending has left the country with a massive debt burden. But this debt is subject to a limit mandated by Congress. When the debt nears the limit, Congress usually raises it to allow the government to continue borrowing money. But as the government spends at an ever increasing pace, Congress has had to raise the limit with increasing frequency. As we once again near the debt ceiling, what’s at stake? We go beyond the headlines for all the facts you’re not hearing. Watch the video below. For more information on the facts in the video, see the fact sheet below. Washington is a buzz about our nation’s heavy debt burden and the impending debate regarding the debt ceiling. Many in Washington insist that the debt limit must be raised, or the United States will default and send our economy into a downward spiral. But are these predictions based on facts? The debt ceiling, which is the legal limit on borrowing by the federal government, was created to control and limit Washington’s spending and debt. It hasn’t worked. Since 1940, lawmakers have increased the debt ceiling 100 times (i). And as spending exploded over the last decade, the ceiling has been raised 10 times (ii). This overspending has saddled taxpayers with a debt of more than $14 trillion (iii), which is nearly the size of our entire economy. Will Washington Default if We Do Not Raise the Debt Limit? Yes and no. Washington could actually hold off on raising the debt ceiling for months (iv), before default or being unable to repay our lenders becomes a serious risk. Like a person with credit card debt, our government won’t default on its debt so long as it can continue to pay the interest payments on that debt. And the US’s $2.2 trillion in tax revenue more than covers the $200 billion in interest owed this year. If Washington had to, they could pay for all of its bills for months by doing things like selling unused assets, shifting cash around and borrowing money from the Fed that doesn’t count toward the debt ceiling. But, that’s only a band-aid to buy us time for real reform — and it hides the real problem. Revenue still only covers 60 percent of the total bill. Unless spending is cut, we risk defaulting under an excessive debt burden. The debt ceiling keeps increasing because of years of government overspending. Spending has increased well above its healthy historic average and, without reform, will shoot up dramatically (v). Tags: beyond the headlines, debt, debt ceiling, debt limit, federal debt, federal debt ceiling, Government Overspending, Government Spending, national debt, new video, spending cuts, video To share or post to your site, click on "Post Link". Please mention / link to America's Best Choice. Thanks! Posted by Bill Smith : Post Link --> 1:47 PM 0 Comments - Share Yours! Tags: seahawk drilling, Heritage, Heritage Foundation, IER, Institute for Energy Research, permitorium, moratorium gulf oil, spill To share or post to your site, click on "Post Link". Please mention / link to America's Best Choice. Thanks! Posted by Bill Smith : Post Link --> 4:52 PM 0 Comments - Share Yours! Tags: Red State, Adam Hasner, Erick Erickson, Florida Senate, Republican, Conservative To share or post to your site, click on "Post Link". Please mention / link to America's Best Choice. Thanks! Posted by Bill Smith : Post Link --> 8:38 AM 0 Comments - Share Yours! by Steven Ertelt, LifeNews: Last week, the Florida state House of Representatives approved six pro-life bills that reduce or limit abortions and abortion funding. The legislation has the strong support of pro-life groups. Bill Warren, the Director of Policy and Communications for the Florida Family Policy Council, told LifeNews.com he is proud of the sponsors of the bills and the lawmakers who voted for them, and he urged pro-life Floridians to let their legislators know they appreciated the vote. “We are extremely grateful to each of these members for their support of Florida’s unborn children. These champions of life have provided an opportunity for us to impact the culture with a message of life. Take the time this week to thank them for their efforts,” Warren said. Ultrasound prior to an abortion (CS/HB 1127) – This bill passed last year and was vetoed by former Governor Charlie Crist. It would require doctors giving an abortion to conduct an ultrasound to determine to the age of the baby being aborted. While the ultrasound is being performed, the doctor must explain the images to the mother. The sponsor, Rep. Liz Porter (R), is a first year member from Lake City, Florida. We appreciate her willingness to take on this issue in her first legislative session. The bill passed the House 81-37. Prohibition of abortions after viability (CS/CS/HB 1397) – This bill would extend the prohibition on 3rd trimester abortions that currently exists in Florida statute to also prevent abortions after the child is viable or able to live outside the mother’s womb. Rep. Rachel Burgin (R) is the House sponsor of this bill. This bill passed the House 79-36. Choose Life license plate (HB 501) – The Choose Life license plate is a popular license plate in Florida that allows Floridians to help support agencies that promote adoption in their home counties. Unfortunately, not all of the money collected from the sale of the license plate in the state has been making to those worth agencies. Last year, almost half of the $750,000 collected by the state remained in the trust fund at the end of the year. This bill will send the money collected to Choose Life Inc, which will distribute the funds to worthy agencies around the state in a timely manner. This will ensure the money gets into the hands of those who can use it to assist mothers placing children for adoption. Rep. Dennis Baxley (R) is the House Sponsor of this bill that passed 82-35. Public Funding of Abortion (CS/HJR 1179) – This bill gives Florida voters the right to decide whether we should constitutionally ban the use of state or public dollars to fund abortions. If it passes both chambers, it will go on the ballot in 2012 for the voters to consider. If 60 percent of Florida voters approve it, this prohibition would be enshrined in the Florida Constitution. This bill, also sponsored by Rep. Dennis Baxley (R), passed the House 82-35. It was brought up in the Senate and they amended the bill to allow for state funding of abortions when the life or health of the mother was endangered. With this amendment, the Senate passed the bill 27-12 and sent it back to the House. Because the bill was changed in the Senate, the House will have to reconsider the bill this week and take another vote. Public Funding of Abortion (CS/HB 97) – Under the Patient Protection and Affordable Care Act (Obamacare), states are required to establish insurance exchanges through which citizens and small businesses would be able to purchase insurance. The law allows the states to “opt out” of providing insurance for abortions through these exchanges. This bill is Florida’s opt out bill and would continue the long standing policy of not using public money to fund abortions. The bill, sponsored by Rep. Matt Gaetz (R) passed the House 80-37. The Senate amended the bill to allow for abortions to protect the health of the mother and then passed the bill 28-11. With the changes, the House will have to vote on the bill again this week. Parental Notification of Abortions (HB 1247) – Florida’s parental notice of abortion law has been in effect since 2005. To protect minors in extreme situations, the original law created a path through the court that a minor could take to avoid informing their parents before an abortion. This bill makes changes to the bypass process to ensure parental involvement in these decisions unless it would not be in the best interest of the child. Rep. Kelli Stargel (R) sponsored this bill which passed 82-35. Tags: LifeNews, Florida, Pro-Life, bills To share or post to your site, click on "Post Link". Please mention / link to America's Best Choice. Thanks!